Massages don’t just feel good, they feel amazing! And, they have health benefits too. Scientists have discovered another reason to indulge in regular massage sessions: this simple pleasure can lessen depression, lower blood pressure and help to ward off colds. When was the last time you had a massage? If you’re feeling tired or stressed and need an instant boost, try an Indian head massage. 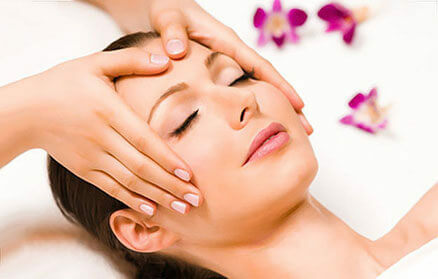 The Indian head massage has been practiced in India for over a thousand years. The aim of it is to release the stress that has accumulated in tissues, muscles and joints of the head, face, neck and shoulders. The use of oils during this holistic treatment is believed to transform emotions and have healing effects on your body. A range of different movements including deep kneading and compression movements over the neck, shoulder and scalp areas will be performed during your Indian head massage. You will be fully clothed and sat in a massage chair for the treatment, enabling you to drift off to somewhere warm and inviting whilst our massage therapist releases tension and relaxes muscles you never knew you had. The session usually last twenty to forty-five minutes, and an extra ten or twenty minutes of silence is allowed once the massage has been completed for further tranquillity. Indian head massages help increase joint mobility and flexibility in the neck and shoulders. It’s especially good for relieving stress, tension, fatigue, insomnia, headaches, migraine and sinusitis. This relaxation treatment also improves blood circulation, frees knots and aids in the elimination of toxins and waste products. Clients report that the experience is deeply calming and relaxing, leaving them feeling energised and revitalised and increased concentration levels. And, some people enjoy the massage because it involves a caring, comfort, a sense of empowerment and creating deep connections with their massage therapist. If you’re looking to unwind, empower your mind and relax your body, book an energising Indian head massage. Swedish massage is another type of therapeutic massage available and performed by our massage therapist. It’s a body massage where more pressure is applied to muscles and joints, reducing stress, improve circulation and movement. Like the Indian head massage, it also provides the deep relaxation that allows our minds and bodies to rejuvenate. We also have a therapist specialising in sports massage therapy, and manual lymphatic drainage. Sports massage is not designed to be relaxing and can be quite intense. It can benefit anyone that exercises even if it’s only regular walking and isn’t just for professional sports people or the very active. To book a massage treatment call us on 01708 225555 or contact us.